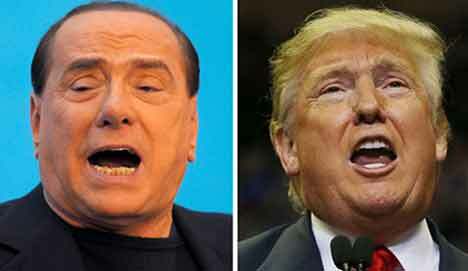 Is Donald Trump a fascist? Quite a few liberals have said so, on web sites such as The New Republic, Slate, and Salon.1 So do some establishment “neo-conservatives” like Robert Kagan,2 who quit the Republican Party in order to become a Hillary Clinton advisor. You can hear the same thing from reformist leftists, such as the misnamed Revolutionary Communist Party (RCP) of Bob Avakian, which has launched a web site, www.refusefascism.org. Another Stalinist outfit, the Progressive Labor Party (PLP), treats Trump as a fascist, just as they did with Democrat Barack Obama (even as PLPers participated in Obama’s election campaign!). Concentration camps around the corner? They’re already here for immigrants. 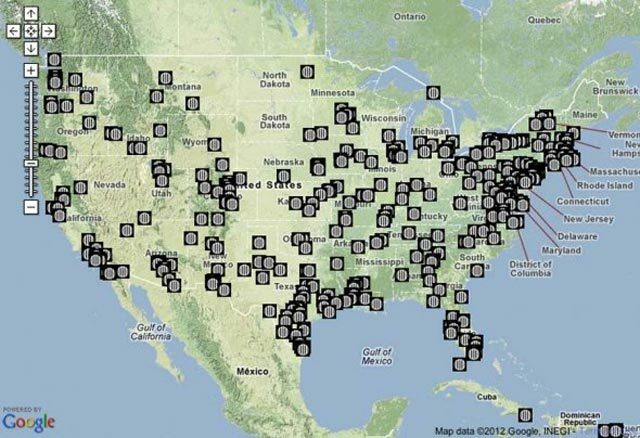 Map of 961 detention centers of the Immigration and Customs Enforcement police holding some 40,000 people for deportation. The election of Trump is a threat to African Americans, Muslims, immigrants, organized labor and democratic rights generally. It is important to note that, while those who voted for him were well aware of his repulsive statements, this does not mean that all Trump supporters are primarily motivated by racism, as Hillary Clinton suggested with her remark about his voters as a “basketful of deplorables.” In Midwestern “rust belt” states quite a few workers voted for him as a protest against the anti-worker “free trade” policies of the Democrats (and Republicans) that have led to the wholesale destruction of industrial jobs. Certainly much of the hard-core racist sector of the electorate voted for Trump, and racist forces were emboldened by his victory. But fascism is far more: it is the mobilization in the streets of desperate shock troops for the bourgeoisie to smash the workers movement, obliterate oppressed groups labeled the “enemy within,” and destroy every vestige of bourgeois democracy. It’s important to be clear: being a vicious anti-Mexican, anti-Arab, anti-black race-hater, a sexist and national chauvinist, a union-basher and advocate of unfettered police power, does not in itself make Trump a fascist. Some throw around the term as an all-purpose epithet meaning “very bad.” Others use it to mean “very repressive.” But there are plenty of repressive regimes that are not fascist. Fascists helped bring the junta to power in Chile in the bloody Santiago coup d’état in 1973 with the backing of the U.S. government, but the Pinochet regime was a classic Latin American military dictatorship, resting on army bayonets, not fascist mobs rampaging in the streets. Defining fascism just as repressive actions actually prettifies bourgeois democracy, that is, the “normal” class dictatorship of the capitalists, which is and always has been based on racism, imperialist conquest and police violence in defense of private property. Using characterizations loosely and imprecisely can lead to political disorientation. Analysis is often driven by policy. Thus Stalinists frequently label all sorts of regimes and forces “fascist” in good part in order to justify building an “anti-fascist popular front,” as Stalin’s henchman Georgi Dimitrov called for in 1935, seeking to tie the workers to a political alliance with supposedly “anti-fascist” capitalist forces. This marked the definitive passing over of Stalinism to reformist support for capitalist rule, openly rejecting the program of international socialist revolution of the Bolsheviks led by Lenin and Trotsky. The result was a disaster for the working class in the Spanish Civil War and since. You can see the popular-frontist policy in protests on Inauguration Day, January 20, as various reformist leftists call for “unity against Trump” (or “Trumpism,” or “Trump’s agenda”). This is an implicit – and sometimes explicit – call for an alliance with bourgeois “progressives,” like supporters of Democratic Party “socialist” Bernie Sanders. Revolutionary Marxists and class-conscious workers call instead for class opposition to Republicans and Democrats, and all capitalist parties, and for a workers party to fight for a workers government. The answer to Trump, and to genuine fascism, is not allying with “anti-fascist” bourgeois politicians – who defend the same classinterests as the fascists, and consequently block any real fight against capitalist attacks – but to fight for socialist revolution. “At the moment that the ‘normal’ police and military resources of the bourgeois dictatorship, together with their parliamentary screens, no longer suffice to hold society in a state of equilibrium – the turn of the fascist regime arrives. Through the fascist agency, capitalism sets in motion the masses of the crazed petty bourgeoisie and the bands of declassed and demoralized lumpenproletariat – all the countless human beings whom finance capital itself has brought to desperation and frenzy. This scenario is not a description of what is happening in the United States today. 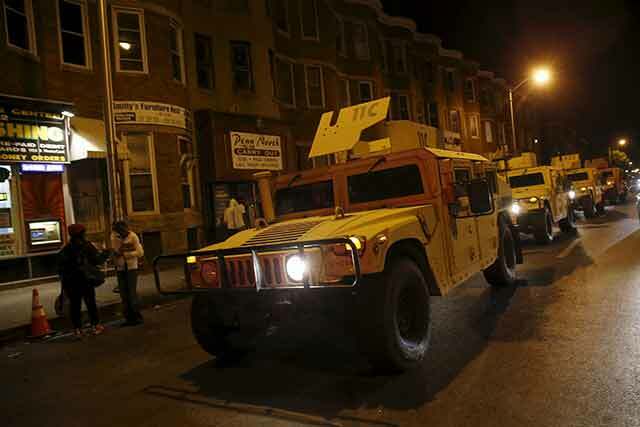 What is happening is plenty dangerous, a drive toward increasing bonapartism, that is military/police rule. Moreover, the ominous expansion of police powers has been promoted by the Democratic administrations of Bill Clinton and Barack Obama no less than by the Republican Bushes. It is the product of decaying capitalism which increasingly discards its “democratic” trappings. There is a coterie of unvarnished militarists soon to be at the helm of the Pentagon and intelligence agencies. There are the Wall Street bankers from Goldman Sachs who are now in charge of Trump’s economic policies. You have token Republican Party establishment figures, like Republican National Committee chairman and White House chief of staff designate Reince Priebus, whose job is to keep the Congressional majority in line. And there’s Trump’s chief ideologist, Steve Bannon, who ran the presidential campaign during the final months. Bannon, a millionaire former Wall Street investment banker and Hollywood movie mogul, is an utter reactionary and rabid right-winger. As soon as Bannon took charge of Trump’s campaign, there was an uproar over his anti-Semitism, quoting his ex-wife and other informed sources. Bannon supporters responded by asking how could he be promoting hatred of Jews since he is a big supporter of Israel. Actually, there are plenty of supporters of Israel who are virulent anti-Semites: the Republican Party is full of right-wing evangelical zealots who would love all Jews to go to Israel where, they claim, the Anti-Christ would annihilate most of them, prior to the Rapture. The Zionist rulers of Israel long ago learned to live with pro-Israel anti-Semites in the U.S. Congress, whose votes are needed to get billions in Pentagon military aid that they depend on to suppress the Palestinians. That Bannon is an anti-Semite, there can be no doubt. He produced a final (November 6) national television campaign ad, in which Trump rails against the “global special interests” and “political establishment” who have “bled our country dry” as images stream past of billionaire George Soros, Federal Reserve chair Janet Yellen and Goldman Sachs CEO Lloyd Blankfein, all of whom happen to be Jewish. (Bannon, who happens to be Catholic, made his millions as a mergers and acquisitions banker at Goldman Sachs.) Meanwhile, as editor of the Breitbart News website up until last August, Bannon published numerous articles denouncing critics of Israel, which were gobbled up by virulent anti-Semites, as you can see from comments from the site’s devotees. Bannon is a hard-right national chauvinist who rails against “illegal immigration.” As such he has affinities with, and has given a platform to, “white nationalists” and other brands of white supremacists, including out-and-out fascists like former KKK “imperial wizard” David Duke, the “Klan in a suit” who repeatedly ran for political office in Louisiana. Trump hesitated for some days before renouncing the endorsement of his campaign by Duke, and also by the Ku Klux Klan, pretending to “know nothing” about Duke or even white supremacy. But Trump’s father Fred was arrested in a Klan riot in Queens, New York in May 1927. But while neither Trump nor Bannon are fascists, actual fascists are crawling out of their holes and looking forward to the Trump years. Some are open Nazis, like the website the Daily Stormer of one Andrew Anglin, which called for an armed march against Jews in Whitefish, Montana on January 15. The town’s handful of Jewish residents reported anonymous death threats. Their photos, including of children, were posted on the Internet superimposed with the Star of David patch that Hitler required Jews to wear. Local police said they would allow the march in the name of “free speech.” Yet the fascist provocation was not an exchange of views but a staging ground for murder of Jews, blacks, immigrants, homosexuals, leftists and union activists. Stormer Anglin later postponed it for lack of a special event permit. “White nationalist” Richard Spencer, would-be Führer of “alt-right” neo-Nazis, speaking at Texas A&M University in December. Why Whitefish? This mountain resort town near Glacier National Park is the residence of Richard Spencer, the wannabe Goebbels of American fascism. It is the site of the corporate office of Spencer’s National Policy Institute (NPI), an “academic” front for racist pseudo-science. Spencer disclaimed responsibility for the threatened Nazi march in his hometown, but when he was interviewed by David Duke on the latter’s December 26 radio show, he had a different line. On the air with his political mentor, Spencer called on Whitefish residents to renounce “Love Lives Here” (a locally based anti-racist organization targeted by the Nazis), singled out local rabbis by name and demanded that residents denounce them, in exchange for cancellation of the march he claimed to have no part in. Spencer came to national media attention when he gave a keynote address to an NPI conference last November, ten days after the election. Reveling in the growth of his movement and its prospects under a Trump administration, Spencer concluded with appeals to “Hail Trump! Hail our people! 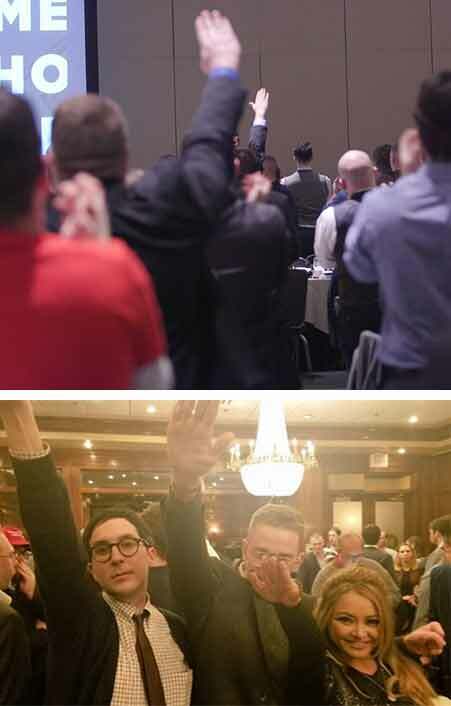 Hail victory!” mimicking Nazi salutes of “Heil Hitler!” and “Sieg heil!” Many attendees responded with stiff-arm Nazi salutes. The political objective of Spencer’s movement is the creation of what he calls a “white ethno-state” to replace the United States. This would require the smashing of all democratic institutions, particularly the integrated organizations of the multiracial working class, which could only be accomplished through genocidal mass murder. This is exactly what Richard Spencer and his ilk are aiming for. 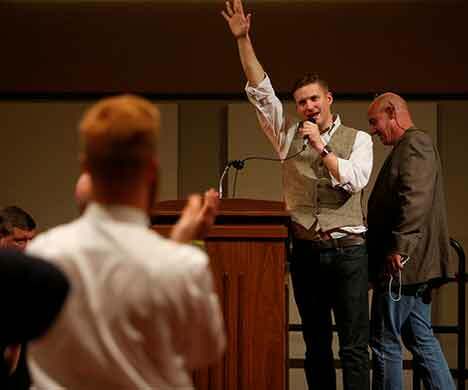 Spencer is the guru of the so-called “alt-right,” a term he coined several years ago to give political cover to the Islamophobic, homophobic, xenophobic, anti-Semitic, white-supremacist ideology of his so-called “white nationalism” movement. 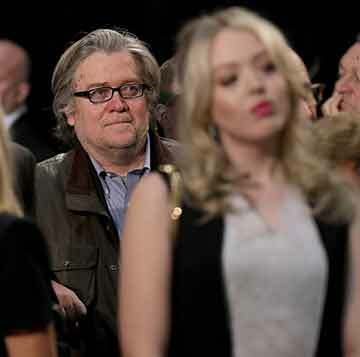 As editor of Breitbart, Trump ideologist Steve Bannon bragged that he had made the web site into “the platform of the alt-right.” But where Bannon traffics in fascistic rhetoric, Spencer’s movement are actual fascist propagandists linked to paramilitary action units, such as the Nazi gangs that threatened to march on Whitefish or the KKK hooded lynchers – terror squads drawn from the decomposition products of decaying American capitalism. While Bannon and Trump are willing to court the fascist vote, their power rests on the established institutions of American capitalist “democracy,” namely the deadliest military and police forces on the planet. In fact, this only makes them even more dangerous to the workers and oppressed people the world over than the fascist scum who fantasize about holding state power. As the Internationalist Group emphasized throughout the spectacle of the 2016 presidential election, Trump’s “border wall” and “deportation force,” the nuclear weapons at his command and his belligerent threats against China were prepared for him by his Democratic predecessors (including the “socialist” Bernie Sanders). As for American racism, that was born with American capitalism as the ideology of a ruling class that established its rule through genocide and slavery. In the United States today, the “normal” means of bourgeois rule are not immediately threatened, as happened in Italy in the 1920s and Germany in the ’30s. This is not due to any internal vitality. On the contrary, the “two-party system” by which a small number of capitalist firms have selected their government for over a century failed spectacularly in 2016 when Hillary Clinton’s coronation was bungled and an unreliable demagogue outmaneuvered the Republican establishment. The hysterical whining from the “intelligence community” and the kept media over “Russian hacking,” i.e., over the leaking of the Democrats’ dirty secrets of conniving with Wall Street, testifies to the bourgeoisie’s self-conscious senility. The only force that could clear away this dead wood, the working class, is kept in such a state of disorganization and political subjugation by its pro-capitalist leaders that the ruling class does not feel immediately threatened by it. Mainly for this reason, the fascist gangs remain marginal in the U.S. They are semi-tolerated, rotating in and out of prison, kept in reserve for when the unstable equilibrium inevitably breaks down. On January 20 and 21, there will be some ritual protests against Trump’s inauguration, either directly or indirectly linked to the Democratic Party. Thus they cannot fight Trump even though he lacks any kind of “mandate,” having lost the popular vote by almost 3 million votes. Meanwhile, racist forces from KKK nightriders to immigration police are feeling emboldened. It will take hard class struggle to defeat Trump’s attacks on the workers. Revolutionists should seek to organize mass labor-centered mobilizations to crush the fascist provocateurs as they attempt to make forays into urban centers of the multiracial working class. In the Pacific Northwest, Class Struggle Workers – Portland sparked a “Labor Against Racist Police Murder” contingent of several unions and scores of unionists in the 2015 May Day march. Now, as rumors have circulated about a planned Klan march, CSWP members are organizing to “Mobilize Labor to Stop the KKK.” Already three unions in the Portland-Vancouver area (Painters, Stage Hands and Carpenters) as well as the Industrial Workers of the World in Seattle have passed resolutions to use their power together with others “against the clear and present danger that the KKK and other racist organizations’ provocations pose to us all” (see box). In the context of such a mobilization, a squad of demonstration marshals could become the nucleus for labor-based defense guards that can effectively disperse the lynchers and Nazi scum. This is a very different perspective from that of those who seek an “anti-fascist” adventure while avoiding the hard political struggle in the unions against sellout bureaucrats, phony “friend of labor” Democrats and the opportunist leftists who tag along after them. Waging that struggle means organizing the power of the working class to take on the labyrinth of anti-labor laws which both the partner parties of American capitalism support to the hilt. It means defeating the poisonous racism that paralyzes working-class solidarity. While the AFL-CIO leaders strained mightily alongside their masters on Wall Street to elect Clinton, many union members didn’t buy it. Seeing no alternative representing the workers, some stayed home, others voted for Trump. Now the union tops seek to outdo Trump in pushing nationalist protectionism – that is, protecting the corporations’ profits and dividing the workers against each other. Against this bankrupt program which has produced nothing but defeats for decades, Portland Painters Union Local 10 last August called for no vote to the Democrats or Republicans, or any party of the bosses, and for labor to build a class-struggle workers party. That together with real labor action against the attacks on African Americans, Latinos, immigrants and all working people, is what it will take to defeat Trump … and the Democrats. Following the victory of the racist, anti-immigrant, woman-hating Republican Donald Trump over the warmongering representative of Wall Street Democrat Hillary Clinton in the November 8 U.S. presidential elections, the hooded fascists of the Ku Klux Klan announced that they would hold victory rallies. As rumors spread that the KKK intended to stage such a provocation in the Portland, Oregon/Vancouver, Washington area, Local 10 of the Painters and Drywall Installers Union (IUPAT) unanimously approved a motion calling for a working-class mobilization to stop the KKK lynchers and other racist forces in their tracks. Since this resolution was passed, similar motions were approved by IATSE (Stagehands) Local 28, Carpenters Local 1503, and the Seattle branch of Industrial workers of the World (IWW). Whereas, unions are considered a threat to the KKK and other racist organizations because they are a working class defense organization for all workers in the community. * Due to a typographical error, this figure was originally given as 400,000 rather than the correct number of those held in U.S. detention centers, 40,000. 1. “Yes, Donald Trump is a fascist,” New Republic, January 2016; “Donald Trump Is a Fascist,” Slate, 25 November 2015; “Trump’s not Hitler, he’s Mussolini: How GOP anti-intellectualism created a modern fascist movement in America,” Salon, 11 March 2016. 2. “ This is how fascism comes to America ,” Washington Post, 18 May 2016. 3. From his essay on “Ur-fascism,” New York Review of Books, 22 June 1995. 4. Leon Trotsky, “On the Jewish Problem” (1937-40).